We are well into Autumn now, and as it gets colder outside and the heating goes on condensation is becoming more of an issue. 70% of reported domestic damp can be attributed to condensation, and it is undoubtedly a contributing cause of damage to walls and furniture. 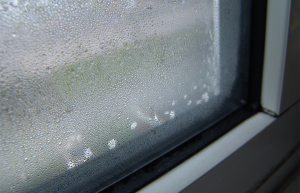 Condensation can commonly be attributed to a lack of balance between heating and ventilation, resulting in a rise in relative humidity. Air can hold more water vapour when warm than cold. As warm air is cooled, such as when the heating is switched off at night, it will deposit the water that it can no longer retain as condensation on a cold surface. Preservation Treatments offer a great solution with our range of positive pressure units. These units replace the damp, stale, air in the property with fresh filtered air. This will not only allow your property to breath but will also eradicate the damaging effects of condensation, damp and toxic black mould. We provide Condensation Solutions throughout London and the South East, including Surrey, Hampshire, Middlesex, Berkshire and Sussex. Call us now on 0800 1422 513 to arrange a survey and receive a full report outlining the best condensation solution for your property.